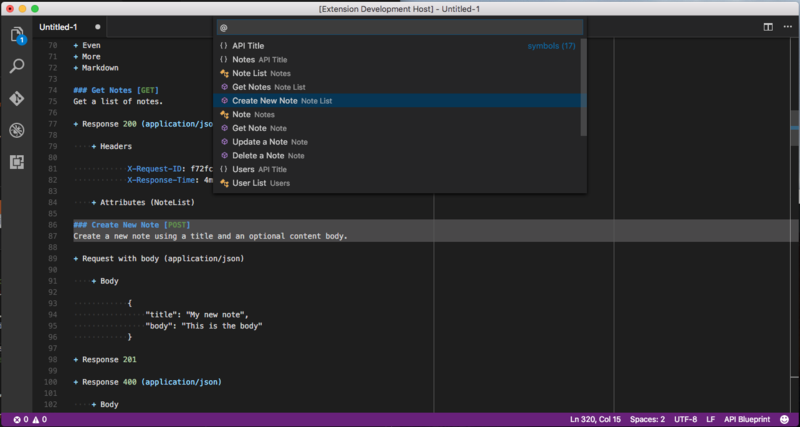 Visual Studio Code>Programming Languages>API Elements extensionNew to Visual Studio Code? Get it now. API Elements is the structure for parse results of both API Blueprint and Swagger, and it is built on the Refract format. It provides a single format for interacting with parse results from various API description formats. So far, only API Blueprint and Swagger are supported. Found a Bug or - do you need a particular feature? Please file an issue at https://github.com/XVincentX/vscode-apielements. Press F5 in the server to debug and use the extension in the VS Host instance. Note: If you're on a Unix envirnonment, you might want to use open.sh file which will open both client and server instances at the same time. Drag and drop the generated vsix file into Visual Studio Code, which will load the extension. The idea would be, of course, to improve symbol navigation as much as possible and exploit sourcemaps in all their power. This, however, might take time. If you feel there are some important symbols I'm missing, please file an issue, I'll be happy to evaluate it. without having to leave the editor at all. Most of the process is actually automated. Thous, it will ask you to provide a token and redirect you to the right page if it's not avaliable on your computer. All those commands are listed with an Apiary prefix. Therefore, to see what you can do, simply type Apiary in the command box to see what's going on.